This story started a long time ago, in 1965. Mike H. and his father built the first "two juice-can rocket." Wooden dowels provided the fin rails, and used tag board for fins. This contraption sparked quite a bit of interest from Mike's first grade class. The first "two juice-can rocket" never flew. There were too many unanswered questions; how much pressure will it hold? How can it be easily pressurized and released for launch? How would it be safely recovered? But a year later Mike M. entered the picture, and a few years later the water rocket effort was re-born. Mike & Mike have built many different rockets through the past 25 years, but the water rocket has received constant interest, and has proven to be a fun and educational challenge. Here we are in December 1969 building a "laser." I'm sure if you check the National Geographic in that timeframe you'll find an issue dedicated to the topic of lasers. "Let's build one! ...glass will work, won't it?" This is a rocket powered ping pong ball. The first rocket we ever made. It flew along a fishing line strung between the fences in the back yard. The adhesive tape has really yellowed in nearly 30 years since it was made. 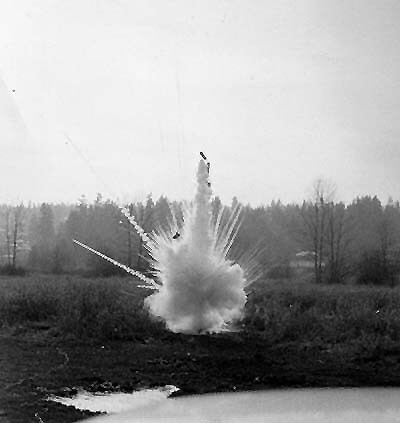 This is a photo of the earliest rocket launch we can find. Despite the appearance, this was a successful launch. The motor remained intact. 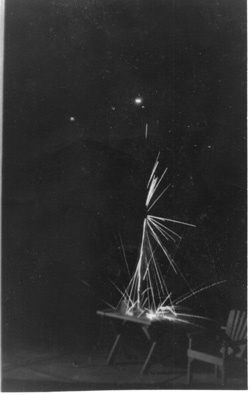 The propellant ejected through the nozzle during launch. 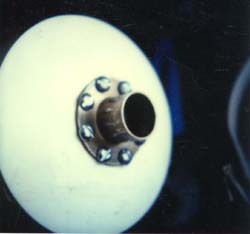 This motor was made from a cardboard tube with wooden plugs, and match heads for fuel. There were many reports in the papers of kids seriously injuring themselves with rockets of this type made with metal casing material. I'm not sure we were fully aware of these reports, but seem to have a healthy fear of the motor's hazards. We used homemade ignitors, powered by a large step-down transformer, which on occasion blew fuses in the house. We were able to trigger the launch by plugging in the extension cord 30 ft. from the rocket. rockets through the years. Often with spectacular results. 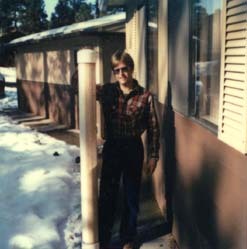 Mike H. displays a water rocket (which never flew) made from PVC pipe rated for 180 P.S.I.